Mac and cheese is a classic side dish that is almost always paired with home style dishes like barbecue or fried chicken in Nebraska. However, there are plenty of restaurants across the state putting their own unique spin on the dish that’s so good you could eat it alone as the main course. Here are the 10 best places in Nebraska for mac and cheese. Mac and cheese is the signature dish at Mark’s Bistro in Omaha. Made with twirly, corkscrew pasta and topped with a blend of cheeses, creamy sauce, panko breadcrumbs, and add-ins such as roasted red peppers or bacon, it’s certainly tough to beat this award-winning mac and cheese. The chipotle mac and cheese at Grateful Bread in Lincoln is to die for, but also on the menu is a Thai and Greek mac and cheese if you’re really looking to switch things up. All three options do a great job of cutting the flavor of rich, delicious cheese and make the perfect side dish or main meal. For a unique, modern twist on the classic mac and cheese, head to Modern Love in Omaha. This popular restaurant offers a delicious vegan twist on the dish made from cashews instead of dairy cheese. 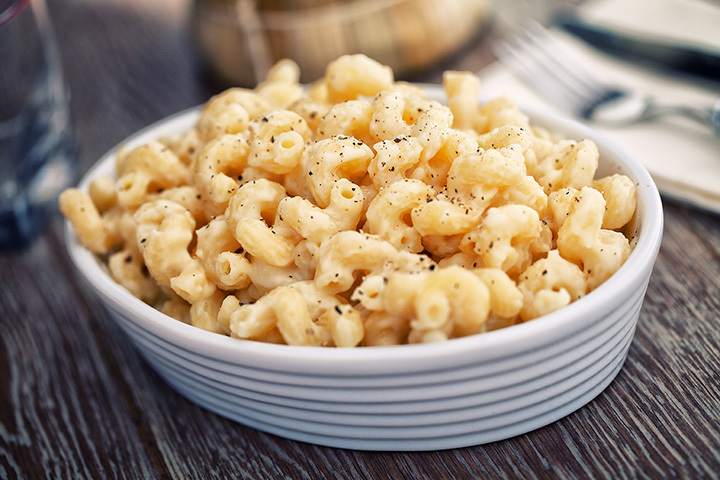 A gourmet mac and cheese that is also vegan-friendly is definitely one not to miss. Who says you can’t enjoy mac and cheese on top of a delicious pizza? Not The Flippin’ Sweet in Kearney. This pizza joint offers a unique way to enjoy creamy, delicious mac and cheese—piled high on top of a pizza. It also comes with bacon. What could be better than that? The mac and cheese at Big Mama’s Kitchen is the no-fuss, classic style mac and cheese like you’d eat at home. Served as a side, it’s the perfect companion to a Southern-style meal at this Omaha favorite. Do yourself a favor and order the chorizo mac and cheese at Ollie and Hobbes Craft Kitchen in Papillion. The menu at this modern, family-friendly eatery is packed with unique dishes that all pair perfectly with this A+ mac and cheese. For a smoky mac and cheese option, head to FireWorks in Lincoln. This creamy, dynamic duo of cheese and noodles is their signature dish and so good that you can even order it to go. Baked in a deep-dish tin, the mac and cheese at Blatt Beer & Table is served piping hot with bubbling cheese and a crisp, brown crust. Spiked with paprika, chives, and panko breadcrumbs, this is a mac and cheese to fall in love with. The chili mac and cheese at the Liquid Sunshine Taproom in La Vista will definitely start a fire in your mouth before it leads into wonderful flavors of cheese. This community sports bar also has 48 craft beers on tap from local and regional breweries to enjoy with your cheesy dish. What’s better than BBQ and beer? Mac and cheese and beer, of course. The jalapeño mac and cheese at C. Berry’s in Lincoln is the ultimate dish when you’re craving cheesy goodness. Open until 3 a.m. on the weekends, C. Berry’s is the perfect place to grab a late night drink and snack.